Excessive speed is often cited as a cause for pedestrian deaths. Traffic calming measures such as speed bumps force drivers to slow down, giving them more time to see and avoid pedestrians. 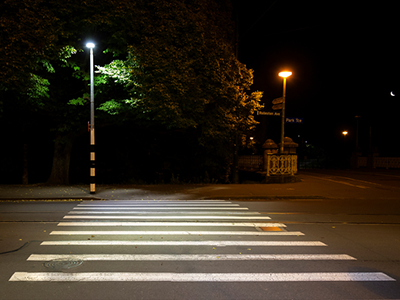 The GHSA study reports that 75 percent of pedestrian fatalities occur at night. Common problem areas include stretches of road that transition from residential to rural and vice versa, where drivers may be less watchful for foot traffic. The more street lighting at a crosswalk, the safer it will be. Drivers can’t heed what they can’t see. Many traffic signs — including speed limit indicators — were made with outdated sheeting that does not maximize reflectivity. By replacing those signs with ones using better sheeting, the improved visibility will increase driver adherence to the speed limit. Not sure if your signs meet reflectivity standards? A retroreflectometer may be what you need. Check out this helpful article for more information. 90 percent at pedestrian crossings — a key reason why the agency announced MUTCD Interim Approval 21 (IA-21) earlier in 2018. As a result, traffic engineers have been quick to install this proven solution now that it's once again compliant on U.S. roadways. But be sure your RRFBs meet the minimum requirements laid out in IA-21. Don't want to spend hours combing through specifications? Simply go with TAPCO RRFBs — we meet or exceed all IA-21 requirements. A popular alternative to RRFBs, a TAPCO BlinkerSign® draws the eye by adding flashing LEDs to a traditional sign. 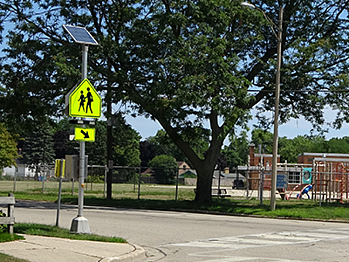 According to a 2011 Vermont study, the introduction of a BlinkerSign® system increased the rate at which drivers yielded to pedestrians in an uncontrolled intersection by 23%, accomplishing a total yield rate of 80%. When it comes to pedestrian safety, you have many options. And TAPCO has many solutions. To view our whole array of products, view our catalog now!